Leaders of Central African countries are set to attend a summit on Saturday on peace, integration and environment in Kinshasa, the capital of the Democratic Republic of Congo (DRC), organizers have said. 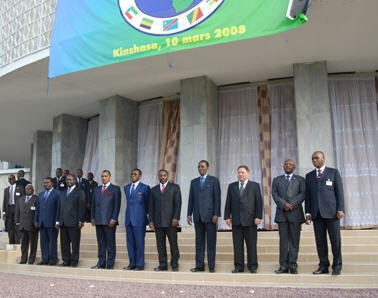 The 14th ordinary session of the heads of state and government of the Economic Community of Central African States (CEEAC) will tackle issues affecting the region, including peace and security, the free movement of goods and people, integration, the development of road infrastructure, energy and the new information technology. Environment and water will also feature in the debates, especially the question of protecting the Congo Basin forests, which is shared by most CEEAC countries. On this matter, the CEEAC leaders will launch a program to assist in the conservation of the ecosystem of Congo Basin (PACEBCO), which is being co-financed by the African Bank of Development (BAD) to the tune of 23 billion FCFA (49 million U.S. dollars) and CEEAC to the tune of 3.5 billion FCFA (7.5 million dollars). They need to adopt a common position on climate change in anticipation of the world conference on climate which will take place in Copenhagen, Denmark in December. On security, the CEEAC leaders are expected to launch their project of creating a multinational force for central Africa (FOMAC). Following other regional organizations like SADC, CEEAC envisions a deterrent force that can rapidly intervene to guarantee peace and security for the people and their goods within the region. The leaders will also reflect on ways and means of promoting regional integration and encourage the free movement of goods and people. Central Africa is today the only sub-region on the continent which is lagging behind in regional integration and the free movement of goods and people. The obstacles, including multiple controls and harassment in the border points of different countries, and multiple taxes imposed on business people, economic operators and other travelers, make the free movement of goods and people impossible and hamper the development of regional commerce. It Kinshasa, the CEEAC leaders will try to remove all these obstacles to make the bloc an investment zone like Economic Community of West African States (ECOWAS), the Arab Maghreb Union and the Southern African Development Community (SADC). They will also examine the effects of the international financial crisis on the economies of CEEAC countries. The financial crisis "has rendered hypothetical the achievement of priority programs of the three main strategic areas that were discussed during the 13th conference of the heads of state and government by the year 2015 which were peace, security and stability, modern infrastructure especially in transport, energy, water and environment," said Congolese Regional Cooperation Minister Raymond Tshibanda. According to sources close to the Congolese Foreign Ministry, Angolan President Jose Eduardo Santos will not attend the Kinshasa summit because of his busy schedule. Some observers link the absence of Angolan leader to by the current misunderstanding between Luanda and Kinshasa, following the recent expulsion of Congolese nationals from Angola, and then the Angolan nationals from the DRC. The exchange of expulsions was reportedly accompanied by cases of violence, chilling the relations of the two neighboring countries. The DRC has hosted a series of key regional meetings this year with its domestic situation improved in the recent months.